How do I find the nearest shops of a certain category on an OpenStreetMap map? For instance a list of pizza or coffee places near my current address. I know that OpenStreetMap has an extensive classification of amenities, but how to make use of it? I found that the easiest option by far is to search DuckDuckGo for X near Y: a "Places" tab will appear and if you click one of the options a map shows up. It's proprietary and it mostly seems to use Yelp data, which cannot be edited freely, but at least it doesn't track you and it shows an OpenStreetMap map (via Mapbox), which is an encouragement to improve it. 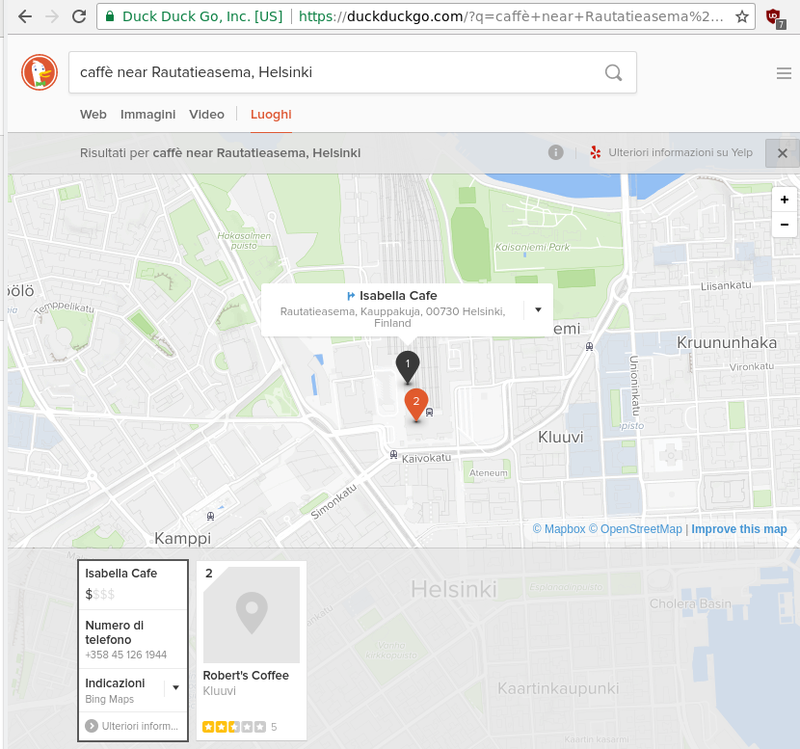 Maybe as the OSM coverage of shops and other points of interests increase DuckDuckGo will be able to ditch Yelp and others will be able to achieve something similar? They also have a blog post on directions in DuckDuckGo. They needn't "ditch" yelp; they can use both yelp and osm data. @dsh4, isn't that what they do now? When I'm lucky, I'm looking for shops with a very precise proper name which every mapper uses consistently (for instance: IKEA), so I just use the https://www.openstreetmap.org/ search bar and Nominatim does a good job at finding the position. In some cases you might search "cafe near X" in osm.org and actually find what you need. The result is generally unpredictable, but chances of success increase if you can learn the magic words and maybe translate them on translatewiki.net. All of the above search are good, but please do remember the whole osm.org has limited capacity as running on voluntary donation. So you'll find good answer to your queries but it's not the osm.org core business. - I'm usually doing search on OsmAnd app (my best off line map app): go to the point where start the search; magnifying glass; category; select the category. Whenever I challenge friends to find the closest gelato place where to go, or similar, the winner is usually the one who uses OsmAnd, whose search feature seems to work quite well. Simply go to the point where to start the search; click the magnifying glass; click category; select the category. I'm not sure how much data you have to download to benefit from it though!